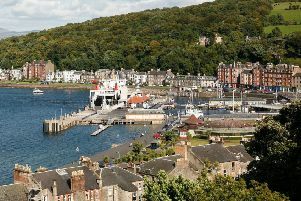 CalMac's MV Argyle approaches Rothesay pier. More talks will take place on Monday in a bid to resolve the dispute between CalMac Ferries and the RMT union which is threatening to disrupt ferry services to Bute and elsewhere next week. RMT members working on board CalMac’s ferries will refuse to work overtime on Wednesday, June 24 and Thursday, June 25, and will go on strike altogether on Friday, June 26, in a row over pay and conditions sparked by the tendering process for the next ferry service contract for the Clyde and Hebrides. Talks between the two sides on Thursday were described by CalMac as “constructive”, but the plans for industrial action remain in place. The issue was raised at First Minister’s Questions in the Scottish Parliament on Thursday, when Nicola Sturgeon denied that the contract process - in which CalMac Ferries Ltd and a subsidiary of private sector outsourcing firm Serco are the only bidders - amounted to the privatisation of the service. “Bidders are required to deliver services to a detailed specification, based on our ferries plan and subject to strict contractual conditions,” Ms Sturgeon told Labour Highlands and Islands MSP Rhoda Grant. “The Scottish ministers will retain public control of the ferry services throughout the contract period, regardless of the ownership status of the successful bidder, and the vessels and ports that are currently in public ownership will remain so.